Amidst all the cool new products and overwhelming amount of outdoor gear, clothes, and business being done, what really stood out today was how much "good" is happening at this trade show. Some of my favorite non-profits American Hiking Society, Outdoor Industry Women's Coalition (OIWC), the Sierra Club, and many others are at the show working on partnerships and bringing awareness to the amazing work that they do. There are also a lot of companies out there already supporting these types of groups and issues that are so important to the outdoors. Starting at 4 pm each night different companies host Happy Hours as benefits to various groups. Among these, Black Diamond hosted a Happy Hour and book signing of Women Who Dare by Chris Noble to support OIWC. After the show was over we were invited to an event hosted by Klean Kanteen celebrating their 10 yr anniversary. This company was founded on the premise that they wanted to make a change and in the past 10 years have given back 1 million dollars to support great groups and causes such as 1% For the Planet, 5 Gyres, American Hiking Society, and Outdoor Afro to name a few. Think about that a company so committed to the environment and the outdoors that they are willing to donate 1 million of their profits to support what they believe in. Serious inspiration everywhere. And to close out the show I was able to meet another person who is really trying to make a difference and bring awareness to global issues through his photography, Corey Richards. Sometimes it is not about the coolest new gadgets. I wish I was talking about taking my house trash to the curb... Unfortunately I'm talking about trail trash. My favorite morning hike is in the local mountains right by our house. The great news is this beautiful area is easily accessible, the bad news people don't have a lot of respect for it. A last minute head's up to join a friend for a hike last Tuesday turned into a lovely afternoon. 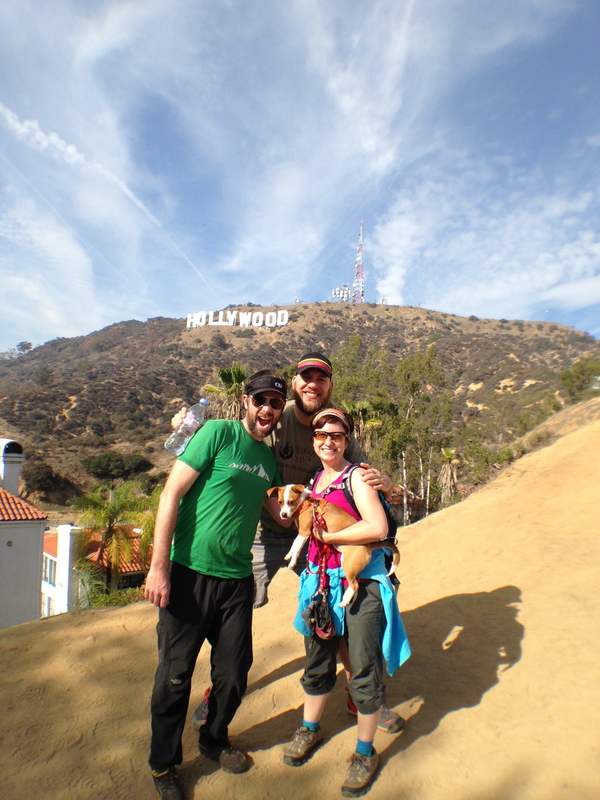 While at Outdoor Retailer, a couple of weeks ago, a friend, and Director of Sierra Club Outdoors, Stacy Bare said he was might be doing a hike to the Hollywood Sign. 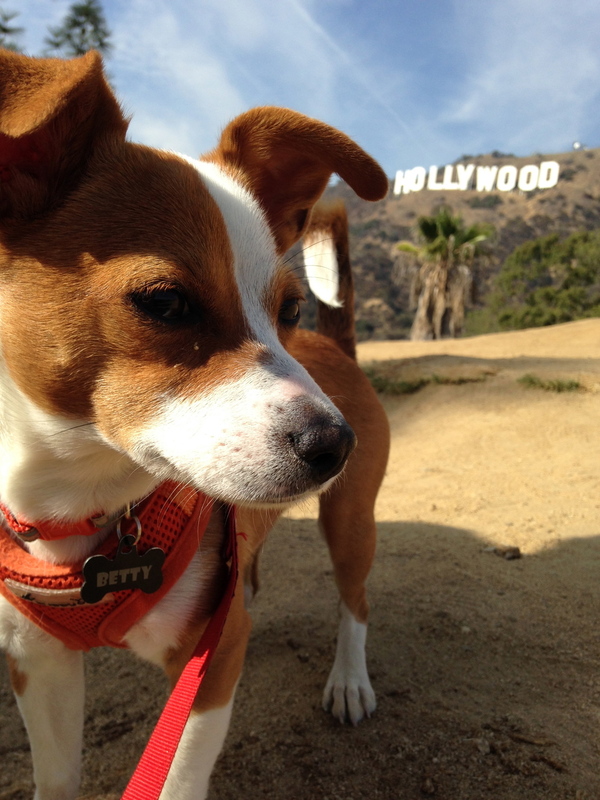 Despite being born in Hollywood and living in Southern California for a couple of decades, I have never done this hike. So I figured what better excuse than a friend coming in from out of town to head into the Hollywood Hills. Realizing that I had not actually asked what day the hike was going to happen, a quick email exchange cleared up that the meet-up point was at the top of Beechwood Canyon/Sunset Ranch @ 1pm. Paul, Betty and I met up with some Stacy, some Sierra Club volunteers, veterans, and actress, Brooklyn Decker. We were a small but merry band with Betty embarking on her first hike! This is a family-friendly & pet-on-leash-friendly hike with the best views of the sign being from a mid-way point below it. Once you get to the top there is a chain link fence preventing you from getting to the actual sign and you have a view of the back of the sign. Round trip the hike is 3-4 miles and all fire roads. You may not believe me, but until I Googled her after the hike, I had no idea who Brooklyn was. During the hike we learned about her volunteer work with the military and veterans, and that she is going to be helping bring awareness to getting youth outdoors as an Ambassador for Sierra Club Outdoors! It was great to form an opinion of someone based on actually getting to know them a little and not have a pre-conceived idea of what they might be like based on their celebrity. Always inspiring to meet someone using their influence for good and supporting a great organization like Sierra Club Outdoors! The Sierra Club Outdoors is something we believe strongly in. 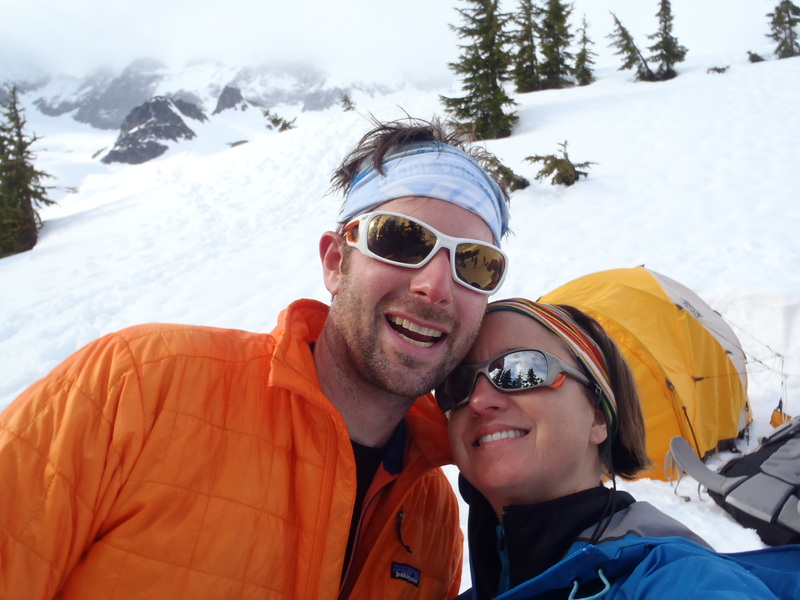 We are instructors for the Wilderness Travel Course (WTC) which is part of Sierra Club Outdoors, as well as volunteers for the Advanced Mountaineering Program (AMP). 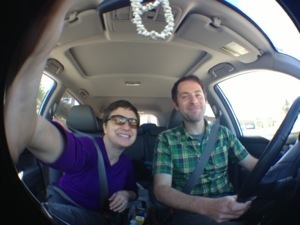 We are also on the path to become rated Sierra Club trip leaders to bring others into the wilderness. How can we expect people to want to save our natural places if they have never experienced them? Last night at our first WTC class a friend described WTC as "a gateway drug" to the outdoors, we all laughed but it is true. We are teaching outdoor skills that give people the confidence to go out and enjoy nature…. and maybe even bring friends and inspire others…. and so on and so on. Wouldn't it be great if everyone could become addicted to nature. So here is my shameless plug to check out Sierra Club Outdoors. They have tons of programs and events focused on getting people outdoors! CONNECTING PEOPLE TO NATURE, BENEFITING BOTHSierra Club Outdoors reaches across economic lines, cultures, and communities, to engage all Americans -- including military and youth -- to explore and enjoy the natural world. For more info on Brooklyn's involvement with Sierra Club Outdoors, click here! 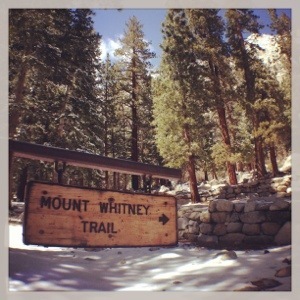 A friend recently told us they couldn't wait to read about our Whitney trip... to which I replied you should read our blog post. "Hmmm" was his response "must have missed it". NOPE somehow this was never published. So here it is better late than never! 11:00 am Saturday Mt. Whitney, Lone Pine, CA 14,505ft The shutters clicked with crazy abandoned, we were all very excited and enjoying our perfect weather on this perfect summit. The team signed the registry, noting where they were from, New York, Laguna Beach, Denver, Boulder, Boise, Pasadena. We took pictures with our flags, with each other, with the mountain and looked down to where we came from... and still had to return to. 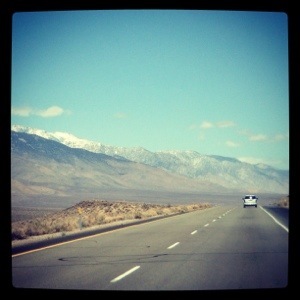 7:00 pm 6:00 pm Wednesday Whitney Lodge Lone Pine, CA 3,727ft We moved dinner up so we could get to bed earlier. Saveria and I would meet the team for the first time in its entirety. We had driven up from Pasadena, got settled then took a drive to Whitney Portal with two of our team mates earlier now we were sitting down for a final civilized meal, meaning with chairs. The team was in great spirits some arrived just in time for dinner others were excited we moved up the time so they could catch Survivor before turning in. We talked about where we were from and our experience the weather forecast, but I'm sure most thoughts were on the mountain ahead which for most of the day was covered in one cloud. Team one was already up there and reports of snow and wind were coming to our guides. 12:00 pm Saturday The Notch, Mt. Whitney 14,000ft We down climbed the summit block in our rope teams with our guide bringing up the rear giving us support and tips. Our guide, Forest lowered us down over the last step section and we gathered at the Notch. We put back on our crampons, grabbed our ice axes and poles, all which we had cashed and began what I thought would be plunge step heaven down the couloir. Well not quite. The snow was softer but just soft enough to ball up our crampons upon each step. The pace became step, step, bang, bang as we hit our crampons with our axes to gather a little purchase for the next go. After a while we reached Iceberg Lake and unroped for a bit, we all walked our own pace thinking about our effort of the past few hours, our teammates, but mostly about breathing. 3:00 pm Thursday Lower Boy scout Lake 10,200ft We reached our first camp after a good breakfast at the Whitney Cafe, I decided to only eat an egg, oatmeal, berries and some toast. We finished breakfast with a gear check some parting wisdom from our guides, Tristan, Thomas and Forest, and we were off. We got to the Whitney Portal took a "clean" photo, the rest of the pictures would be examples of "not clean" photos, weighed the packs, mine was just 3 lbs heavier than Saveria's to her disapproval, and started up the trail. The first fork we came to was the split for the Whitney Trail and the Mountaineers Route, the last time Saveria and I were here we took the left fork, to the trail this time the right, Mountaineers Route here we come! It was not bad walking and we just concentrated on breathing and rest steps for most of the way, the biggest challenge was near the end the Ebersbacher Ledges It was the first exposure we faced on the trip with a bit of climbing needed, super exciting, we were in it now. We reached camp and started to soak it all in, while eating a great dinner provided by the guides. 3:45 pm Saturday High Camp 12,000ft After roping up one last time down a steep snow section which we had done in the dark earlier this mourning we unroped fro the last time and skipped all the way into camp, or at least it felt like that in our heads. Everyone started stripping down as it had gotten very warm, I got down to a T shirt and bare feet. I laid down for a while and thought mostly of how I was happy of my training, my fitness was good but I need more practice climbing in plastic boots. As Saveria recovered in the tent I was outside getting a little cold, I realized at 12,000ft it is probably colder than I think, I put my socks and boots back on and a light jacket, much better. I sent a message out on our Delorme inReachSE that we were down safe. Now time for dinner. 4:20 am Saturday High Camp 12,000ft Our headlamps lit up the trail as we headed out. No one was tired, we got hot drinks and a small breakfast, harnesses on and we set out. We got to Iceberg Lake as the sun was coming up, our guides had ordered perfect weather for our ascent. The group broke up into three rope teams we headed up the couloir at a deliberate pace, rest step, breath, repeat. We finally got to the Notch at 14,000ft, just 500 more to go. When there is enough snow you just stay with your crampons and snow climb the rest of the way, because of how warm it has been we instead switched to what I was told was the spring Mountaineers Route which was third class rock scrambling, with some moderate exposure to the summit. We were roped in a team with our guide, Forest and we sent it! I finally peaked over the last ledge and saw the Whitney hut glowing in the light, we made it, half way at least. Now where is my camera? 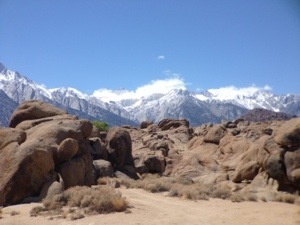 We arrived in Lone Pine, CA this afternoon in preparation for the start of our Summit For Someone climb of Mt Whitney. About 5 minutes after arriving our teammates Roseann and Liane picked us up and we headed to the trail head to check it out. The road was open all the way up which is a good sign. The weather is cold but clear. 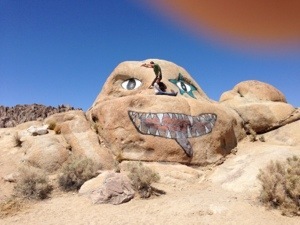 We then headed back down to the Alabama Hills to play on some rocks then headed to the Pizza Factory for lunch. Back to the hotel to rest and do last minute prep. 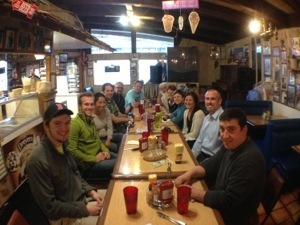 Then back to the Mt Whitney Restaurant for dinner with our team. It was the first time we have all met in person and it was super fun to start to get to know each other. DONATION DEADLINE = April 15th. 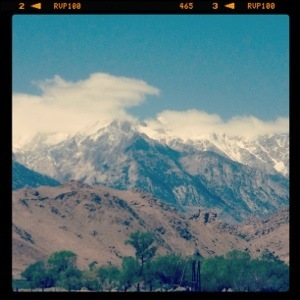 We are ONE WEEK away from our Mt Whitney climb and still need to fundraise $2000 for Big City Mountaineers. We are looking for 20 people to donate $100! These 20 people will get a Thank You certificate, an AdventurUs Patch and AdventurUs stickers! Please help us get underserved youth out into the wilderness this summer... you can make a difference in a young person's life! Click Here to change a young persons life by helping them get outdoors this summer!!! We also have corporate level incentives for anyone who wants to get their company involved with this great cause. We can email you the details if you are interested!